This is a great article. 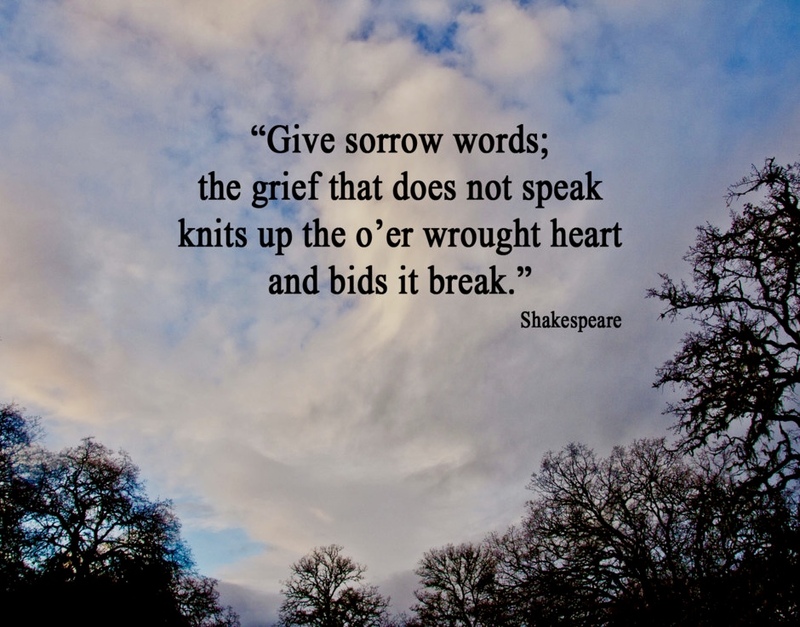 Grief is NOT a problem needing to be “fixed,” something that any person who has every truly experienced a great loss can understand. Solving the problem of grief is a problem in itself: if the ways you are broken cannot possibly be fixed, why does everyone keep giving you solutions? Before my partner died, I was reading There is a Spiritual Solution to Every Problem by Dr. Wayne Dyer. It’s a great book. When I tried to pick it up after Matt died, though, I couldn’t get back into it. It just kept feeling wrong, like there was a burr inside the words that scratched uncomfortably. I kept trying to find comfort in the words I found comforting and helpful before, and those words were just not doing it. I put the book down. I picked it back up. The burr rasped and the words didn’t fit, and I put the book back down. My hope and prayer is that bereaved parents have enough kind, caring people in their lives who are capable of performing both roles for the long haul. It’s so important. October is also National Breast Cancer Awareness Month, and the Susan G. Komen foundation has done a phenomenal job in raising breast cancer awareness around the world! This organization has done a great job since its inception in 1982. My grandmother and mother-in-law both had breast cancer, so I applaud the Komen foundation for its work. “Pink” is everywhere during October and in so many innovative ways. 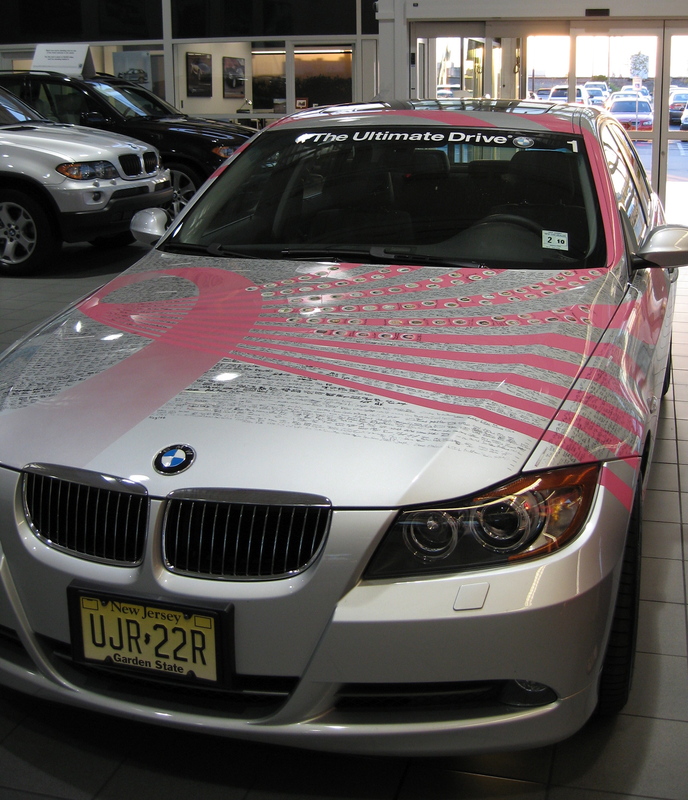 One year, my husband, sister, and I participated in BMW’s Ultimate Drive to Cure Breast Cancer. BMW donated $1 for each mile a new car was test-driven. Driven by local volunteers, a fleet of new BMW cars made its way across the United States from dealer to dealer to promote the Ultimate Drive, and we drove cars from Tulsa to Oklahoma City. I got to drive the lead car as the rest of the cars followed me for the hour-and-a-half drive, and I was proud to be a part of the event to raise awareness. We see “pink” awareness everywhere. Every NFL football team – including big, tough football players, coaches, refs, and many others – sports everything from pink shoes to pink hats to pink towels. Websites go pink. Clothing lines put out “pink” items. Runs, walks, drives – it’s amazing to see so much support! The Make-A-Wish Foundation is also a very high-profile, successful, and well-run organization with huge national awareness and great support. Once again, I think the work they do is incredibly valuable and worthwhile. There are many others whose work is incredibly valuable and worthwhile. But, as a mother who lost a baby at 19 weeks gestation and another child to a drunk driver, I can’t help but wonder how one cause receives so much more support and visibility than another. It’s not that I begrudge either the Komen or the Make-A-Wish foundation their support or successes. I don’t. I wish them all the best!! Finding a cure for ANY kind of cancer would be awesome! Giving a sick child hope or a dream come true is an incredible gift. I guess I’m a trying to figure out how and why people galvanize behind one cause but ignore another. I do have an theory, though. My theory is that it’s easier to focus on hope than loss. Even though there are people who die from breast cancer and there are children who do not survive their illnesses, the Komen and Make-A-Wish foundations focus on surviving and hope. Hope for a cure for cancer. Raising money to find a cure for cancer. Focus on survivors of breast cancer. Hope for a child to continue fighting his or her illness. Giving a child a dream he or she may not be able to achieve without the foundation’s help. Although bereaved parents are talked about in terms of “surviving the death of a child,” we are learning how to survive the death of our child. Our child is gone. There is no hope of bringing our child back. We have to figure out how to live our lives without them. We have to figure out how to find “strength for today and…hope for tomorrow.” Even though child loss awareness was promoted way back in 1988 by the leader of our country, it seems as though it’s an often overlooked or unmentioned topic. I remember when we lost our baby in 1987, nobody said anything at all to me about it. Our pastor announced from the pulpit that we had lost a baby, but that was it. It wasn’t discussed. At 19 weeks, our baby was nearly halfway to due date, but it was as if nothing had happened or that it didn’t matter. I remember feeling like it was a very black year for me. We lost the baby the end of January 1987, my dad’s health declined to the point that we had to put him in a nursing home in August 1987, and then he died the beginning of February 1988. Later that year I helped my mom go through all of my dad’s things. I felt like I just had to keep going on as if nothing had happened, but it was an awful time for me. And I’m sure I’m not the only one who has felt that way. How do we promote more awareness for National Pregnancy and Infant Loss Month? How do we promote awareness for what it’s like to have lost a child – whether through miscarriage, SIDS, accident, or natural causes – and the difficult and often misunderstood walk that follows? How do we promote realistic understanding and unwavering compassion for bereaved parents and their families? How are individuals and communities to consider – as President Reagan said – “how…(to) meet the needs of bereaved parents and family members and work to prevent causes of these problems…”? I don’t see press coverage for any ceremonies of support for bereaved parents. I know that some hospitals sponsor programs and some churches have a ceremony, but generally I don’t hear a lot about the topic of the death of a child. There are books written on the topic and organizations that support the bereaved, but I don’t see a national awareness. Yes, there is the Compassionate Friends and other organizations, but these are targeted to people who have lost a child. Do people read books on child loss or seek out organizations that talk about dealing with the death of a child unless they personally are the one who has lost a child or know someone who has? I know it’s not an easy topic to think or talk about, but does that mean it’s not important to discuss or that it’s not just as important about which to raise awareness? Does that mean we, as bereaved parents, should continue to “buck up” or mask our grief and struggles on this sometimes very lonely and misunderstood walk? I just think it’s something people don’t like to talk about, and I think there is still a huge gap in understanding what it’s like to lose a child and what helps or doesn’t help.